As many of us think about our summer holidays, a whole number of workers are having to worry about taking continued strike action over the coming months. 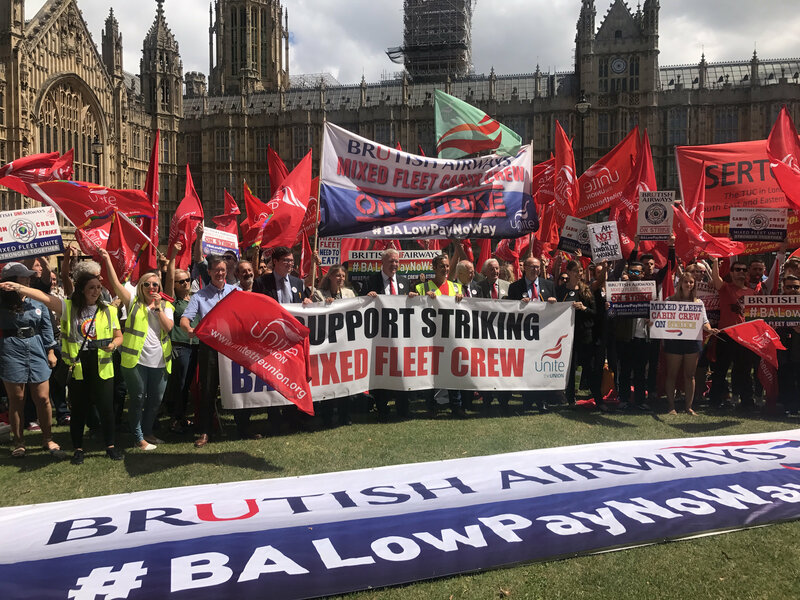 Strikes at the Barts NHS Trust, the British Airways Mixed Fleet cabin crew, Mears Housing workers in Manchester, the Birmingham refuse workers, and the Eastern Avenue Job Centre workers in Sheffield have all escalated their action in recent weeks. Why not invite a striker to address your union branch meeting? Up to 1,000 workers in Bart’s NHS Trust which includes Bart’s Hospital, the Royal London Hospital, Mile End Hospital and Whipp’s Cross Hospital finished a week long strike on Monday having escalated their action from a previous 3 day strike. The are taking on the rich multinational SERCO over low pay. The strike is a brilliant example of how it’s migrant workers who have built and who sustain our national health service – they deserve our absolute support. PCS members at Eastern Avenue job centre in Sheffield, have continued escalation of their dispute and have been on strike for 5 days this week against the closure of their office. The dispute needs your continued support. Rush messages of support to: Leeds@pcs.org.uk Donations via PCS DWP Group, 3rd Floor, Town Centre House, Merrion Centre, Leeds, LS2 8LY. Housing maintenance workers employed by Mears are on strike over unequal pay rates across the country for the same job. The Manchester Unite members are out until 4 August. Donate to the strike fund by cheque payable to “UCATT UD.393 Manchester 1st Branch”, send to Andy Fisher, Unite, 2 Churchill Way, Liverpool, L3 8EF, or online to account 46034412 sort code 60-83-01. Bank of England set for strikes! If you are in London on 31st July you can come and support the first day of action on the picket line at Threadneedle Street.